AS220 IS 30! CELEBRATE WITH US, CABARET-STYLE! That’s right! That’s right! In 1985, AS220 opened in a rented space above the Providence Performing Arts Center, and proceeded to turn the world of arts and culture in Rhode Island on its head. So much so, that we were politely asked to leave PPAC within less than a year! Thirty years later, AS220 has reclaimed and reinvigorated four buildings that house a diverse and vibrant creative community in downtown Providence. Join us on Saturday, October 24th, as we take over, and possibly get thrown out of, another Providence institution for a night of merriment and mayhem, AS220 style! 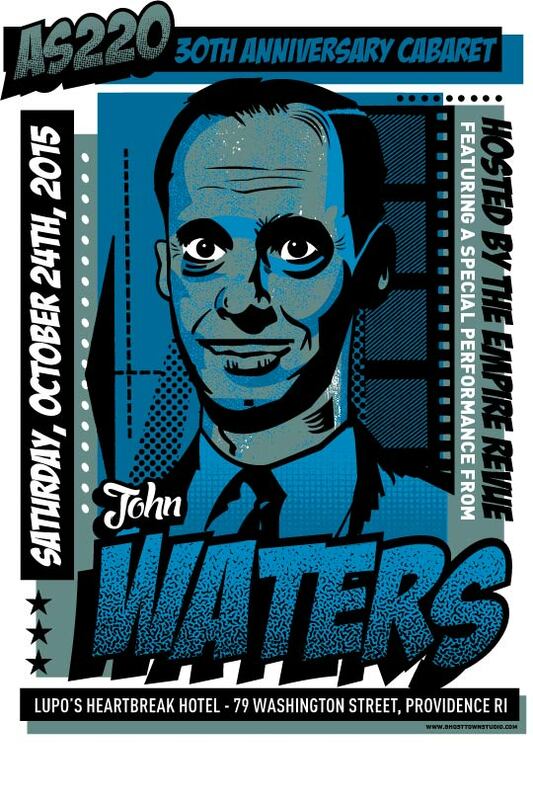 So, to celebrate, on October 24th we’ll be taking over yet another venerable downtown Providence institution, Lupo’s Heartbreak Hotel, for 4 hours of music, comedy, performance, food, drink, and who-knows-what-other AS220 inspired mayhem, with your hosts and entertainers…The Empire Revue and John Waters! Join us as we celebrate, cabaret-style, 30 years of AS220 and creative community in downtown Providence. Tickets for this one-of-a-kind experience are just $75! FREE After-Party (AS220 Main Stage / 115 Empire Street) free admission! VIP After-Party: (AS220 New Main Stage/Satin Doll) SOLD OUT!!! 10:15 – 11:30pm …. John Waters will be on a throne signing his latest book Carsick at the stage of the Satin Doll, we’ll also have durational performances from artists including Purest Spiritual Pigs, Xander Marro, Reba Mitchell, Jason Curzake, Reya Sehgal, drag queen Little Miss HOT MESS, and Darrell Kinsel, with sounds provided by DJ Maralie! Complimentary desserts and drinks by Ellie’s, Gracie’s, and Bottles.